With property prices once again making headlines television producers haven’t been slow to capitalise with the airing of Britain’s newest property show, BBC 2's Building Dream Homes. Seeking to differentiate itself from stable mates such as the elitist Grand Designs, this seeks to portray a more down to Earth look at the profession, employing a fly-on-the-wall documentary style to record the interactions between clients and their professional team. 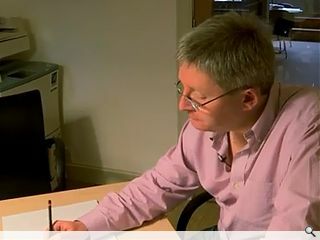 Amongst the architects to feature in the first episode of the run is David Blaikie who is filmed working with a family in Edinburgh on a two-storey extension to their home in an appearance that was projected to draw 1.5m viewers… although as yet Blaikie’s phone hasn’t been ringing off the hook. Commenting on how he came to be involved Blaikie told Urban Realm: “Daniel Twist, producer at Raise the Roof Productions, called me up just over a year ago and told me he was thinking of making a programme after Google’ing award winning architects - I’m pretty sure every single architect in Britain came up. “The programme is almost educational in that the viewing public can see what actually goes on when you appoint an architect and what an architect can do for you. Rather than the Kevin McCloud version of Grand Designs architecture which doesn’t really show the in’s and out’s of it all we wanted to make a programme that promoted the profession and showcase it warts and all. “The programme itself doesn’t go as far as I was hoping it might do but they go further than any other programme on television in explaining exactly what it is that architects and the contractor actually do. “We filmed four or five projects for eight months which was enough to get us through some planning and building warrant procedures, tendering, budget pressures and taking projects on site but the project lapses back into seeing things getting built as opposed to the stuff an architect does in the office. What people don’t understand is that 80 per cent of what an architect gets paid for actually happens before tradesmen start on site, I was hoping that would be what the programme communicated but it wasn’t done in a way which might allow somebody who is about to commission an architect to know exactly what it is they are going to be going through. They did water it down a bit for the sake of entertainment. “Our footage was edited to show the client a wee bit unhappy with some of the work which we spoke to a contractor about and got changed the budget was under pressure and this sort of thing." Seven different practices will be featured across the show’s 15 episode run.